Some estimates suggest that a couple may need $273,0001 for medical expenses in retirement. Medicare could cover some of those expenses, but you'll still need to fund your out-of-pocket costs. That's why understanding how a 401(k) and Health Savings Account (HSA) might work together could make a real difference to your overall financial wellness. An HSA allows you to take tax-free2 withdrawals for qualified medical expenses.So you can preserve your taxable 401(k) withdrawals for retirement. $273,0001 is an estimated amount needed by an average couple to cover medical expenses in retirement. Covering those qualified medical expenses with tax-free withdrawals from an HSA would cost $273,000. Covering those expenses with taxable withdrawals from a 401(k) would cost much more. * Example is for illustrative purposes only. Assumes a 20% total tax rate in retirement: $273,000 x 1.20 = $327,600. Consult with your tax or financial advisor to understand the impact of federal, state and local taxes specific to your situation. Your 401(k) is designed to help you invest for retirement. Your HSA is designed to help you cover qualified medical expenses — now and in retirement. To contribute to an HSA, you must participate in a high-deductible health plan. Another potential benefit is that your employer may match some of your 401(k) contributions. In addition, some employers may make a contribution to an employee's HSA. 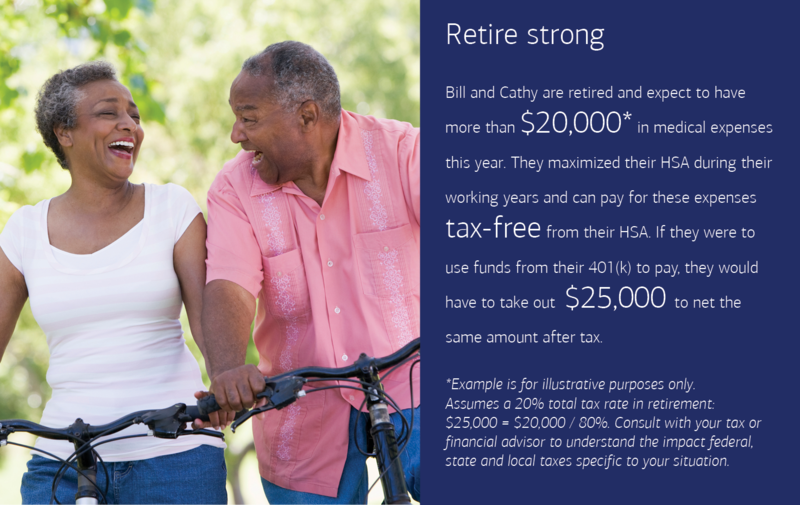 They save on taxes3, and can benefit from the HSA’s buying power in retirement. Their objective is to maximize the tax benefits. Example is for illustrative purpose only. Please consult a tax or other advisor regarding your personal situation. 1 Employee Benefits Research Institute, December 2017. A 65-year-old couple, both with median drug expenses would need $273,000 to have a 90% chance of having enough money to cover health care expenses (excluding long-term care) in retirement. Savings Needed for Medigap Premiums, Medicare Part B Premiums, Medicare Part D Premiums and Out-of-Pocket Drug Expenses for Retirement at age 65 in 2017. A 65-year-old man would need $131,000 or a 65-year-old woman would need $147,000 to have to have a 90% chance of having enough money to cover health care expenses (excluding long-term care) in retirement. Savings Needed for Medigap Premiums, Medicare Part B Premiums, Medicare Part D Premiums and Out-of-Pocket Drug Expenses for Retirement at age 65 in 2017. 2 Withdrawals for non-qualified health care expenses are subject to income tax. 3 About Tax Benefits: You can receive tax-free distributions from your HSA to pay or be reimbursed for qualified medical expenses you incur after you establish the HSA. If you receive distributions for other reasons, the amount you withdraw will be subject to income tax and may be subject to an additional 20% tax. Any interest or earnings on the assets in the account are tax-free. You may be able to claim a tax deduction for contributions you, or someone other than your employer, make to your HSA. 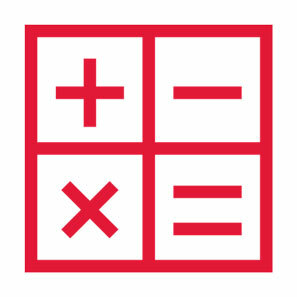 Certain limits may apply to employees who are considered highly compensated key employees. Bank of America recommends you contact qualified tax or legal counsel before establishing an HSA. 4 "You don’t lose funds" refers to account portability and annual rollover of accumulated assets; it does not imply you cannot lose money. The investment portion of the HSA account is not FDIC insured, not bank guaranteed and may lose value. A Health Savings Account can be a great way to save money for out-of pocket medical expenses like doctor visits, dental and vision care and prescriptions. All you need to know about setting up and managing your account.